The ceremony was arranged for 3 pm at the memorial. Although a dull day, it stayed dry for our service. 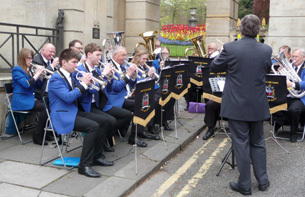 The Bath Spa Band played to welcome those who came to watch and everybody taking part as they took their places, . The poem was written by Beryl Brooks, remembering the bombs that fell around her home in Oldfield Park. To signal the end of the one minute silence a trumpeter from the Bath Spa Band played The Last Post. 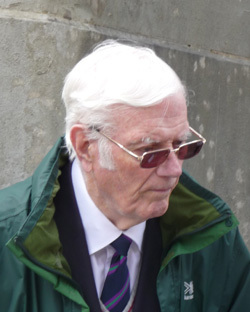 Harry Hemming told the story of two brave rescues. Warden George Lynham received Commendations from HM the King for Brave Conduct in Civil Defence, having entered the ruins of a bombed building in Kensington Gardens to discover that Elizabeth Miles had been killed (and appears on our memorial) but her daughter and granddaughter were alive and trapped under the rubble until Warden Lynham freed them and helped them to safety. Sergeant Bert Brown was awarded the British Empire Medal for his rescue of Mr Valentine Sellar and his wife, two daughters and a girl billetee from the bomb damaged flat above their shop in Wellsway while the bombs were still dropping around it. They all got out alive. 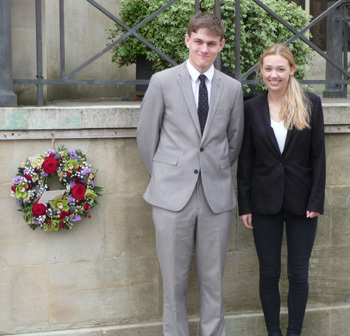 The wreath in memory of those killed in the Bath Blitz was laid by two senior pupils of Ralph Allen School. 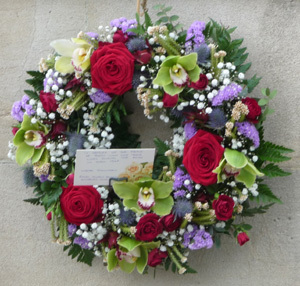 The wreath, donated by Ralph Allen School, included this tribute. Bryan Vowles extended thanks to The Bath Spa Band for their musical contributions, and to Ralph Allen School for the donation of the wreath. He also thanked those who had attended this year's service and gave the date (24 April 2016) of next year's event. 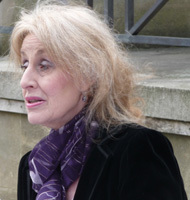 He informed those present that the bomb-scarred former Labour Exchange had secured planning permission for a development which would destroy the significance of the building, despite of the best efforts of the project to get the planning application refused. (It is council policy that public comments are removed from view once a planning decision is made, so we are reproducing here the objections to the planning application and to the listed building application which followed some weeks later). The Bath Spa Band played again as everybody dispersed. Click here for information about the plans for the 2016 ceremony. 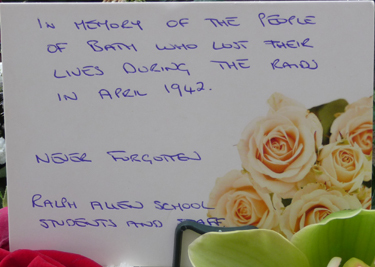 Students from Ralph Allen School laid a wreath in memory of the 417 citizens killed during the Bath Blitz at a special service on Sunday. 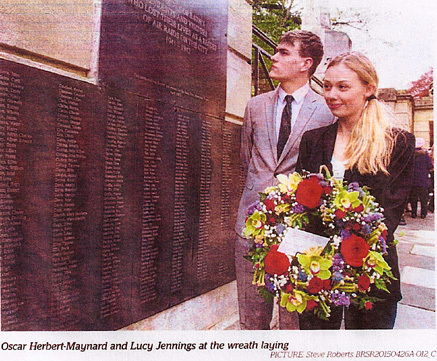 Oscar Herbert-Maynard and LucyJennings took part in the service at the Bath Blitz memorial, by the entrance to Royal Victoria Park. 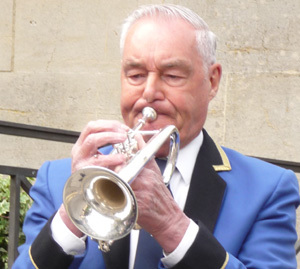 Larry Cole, of the Bath Spa brass band, played the Last Post and a minute silence was held to mark the tragic attack on the city. The City of Bath was bombed for three days by the German Luftwaffe in April 1942. Every year, the Bath Blitz Memorial Projectholds a memorial service, which is often attended by survivors of the bombings. 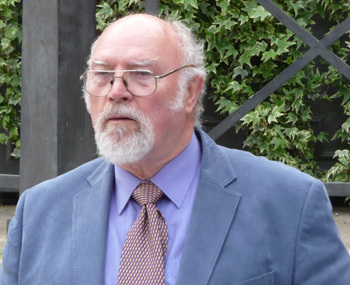 This year's service included a reading from Harry Hemming, who read out the stories of those who worked to rescue people. 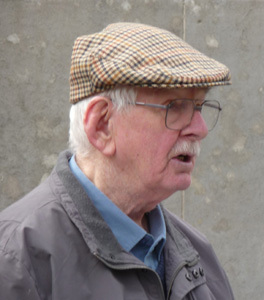 The service was attended by Jack Dargue, 82, who was nine when a bomb fell on his house. 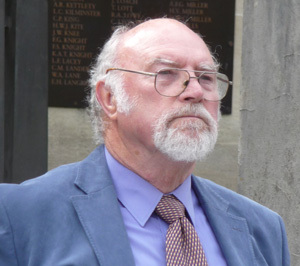 His father James, whose name appears on the memorial, was killed by the blast. Beryl Brooks, 86, remembers bombs falling on her home in Oldfield, and her poem was also read at the service by Kathryn Pond-Barrett. Click here for information about the plans for the 2015 ceremony.